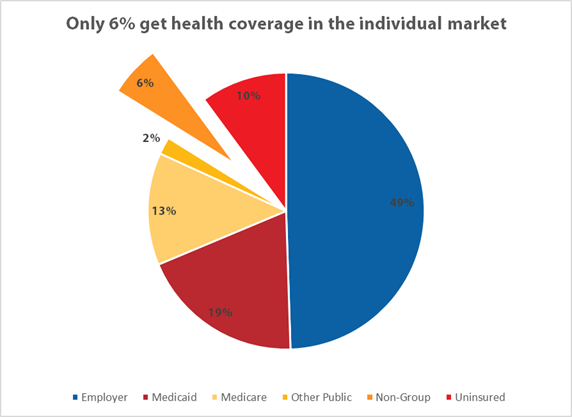 Context alert: Only 6% of those with health coverage get it through the "individual" market. Every morning these days I'm greeted by front-page articles explaining how Obamacare is seriously broken as private insurers are abandoning the exchanges. No question, that's an important problem for the individual, or "non-group" market, though one with many good solutions (I'll provide links in a moment). To be very clear, a 6 percent problem is still a problem, and Obamacare has led to an increase in that corner of the market. But absent the correct context re its minority share, these articles provide the health law's opponents opportunities for over-heated rhetoric, claiming, for example, that we're seeing "the latest piece of evidence that Obamacare is a failed law built on false promises." –President Obama's idea to add a public option: "Congress should revisit a public plan to compete alongside private insurers in areas of the country where competition is limited. Adding a public plan in such areas would strengthen the Marketplace approach, giving consumers more affordable options while also creating savings for the federal government." –Henry Aaron's idea to "Make the Obamacare exchange one big marketplace for everyone buying individual health insurance coverage. Nationwide, this would merge the 12 million people who get their insurance through Obamacare with the roughly 9 million who buy their policies outside the exchanges." To be clear, you'd have to do this state-by-state, requiring that any plan sold in that state's non-group market had to be sold through the exchange, so this is obviously a heavy lift in practice (so far, only DC and Vermont take this approach). But Aaron's idea gets at the heart of the problem, which is expanding the "risk pool" within the individual market to avoid adverse selection problems that have been costly to private insurers, who priced too many of their products for a healthier pool than the one that showed up. My colleague Sarah Lueck offers good ideas on how to make needed risk-pool adjustments.